Last October, Netflix had Stranger Things: Season 2 as its premiere Halloween offering. However, with Stranger Things taking 2018 off the streaming giant is back to doing what it does best – throwing more content at us than we could ever possibly have time for. They’re calling it “Netflix & Chills.” Multiple horror-themed TV shows, both live-action and animated, are headed our way along with various original movies. Malevolent, a new horror movie from Icelandic director Olaf de Fleur Johannesson, is meant to kick this off. Oh, Netflix. Your algorithm just knew that if you put Lady Macbeth’s Florence Pugh in a horror movie I’d have to watch. If only the algorithm also said to put Florence Pugh in a really good horror movie. The plot: It’s Glasgow in 1986. 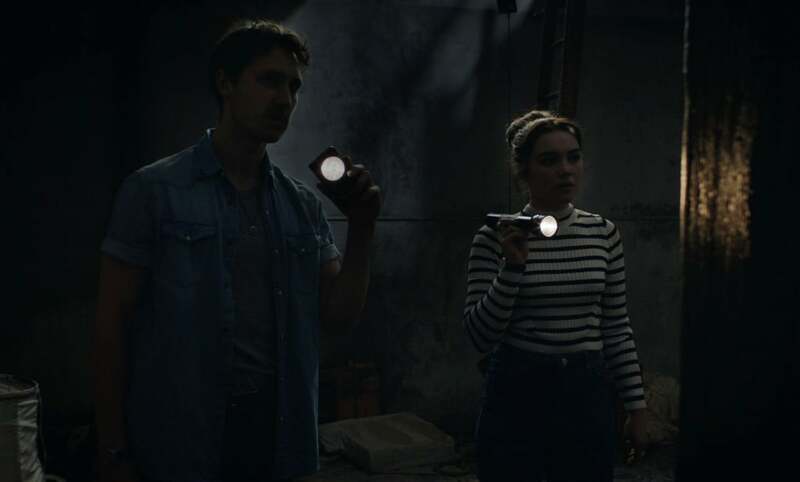 A group of cash-strapped, fake ghostbusters led by brother-sister duo Jackson (Ben Lloyd-Hughes) and Angela (Pugh) take on a haunted house case which might actually be real. However, once in the house it becomes clear ghosts might not be the only threat. By the end, Jackson and Angela will each have to confront the past family trauma which drove them to this line of work in the first place. It involves a seemingly psychotic mother who gouged her own eyes out. Creepy imagery ensues. The script is credited to Ben Kati and Eva Konstantopoulos and is adapted from Konstantopoulos’s own short story, “Hush.” Teamed with Johannesson, they’ve concocted a film which starts out strong, laying everything out for us in a 10-minute cold open before the title card finally arrives. We see exactly how the team fakes the hauntings and get a perfect sense of the relationships. Angela, for her part, is clearly tired of the charade and longing to finish her education as a psychologist. She agrees to take one last, rather lucrative job because her brother is in deep to the wrong people. Will she make it out alive? You’ll just have to watch to find out. I can’t enthusiastically recommend that you do so, though. Malevolent is what we’re increasingly used to from Netflix’s horror movies: disposable. 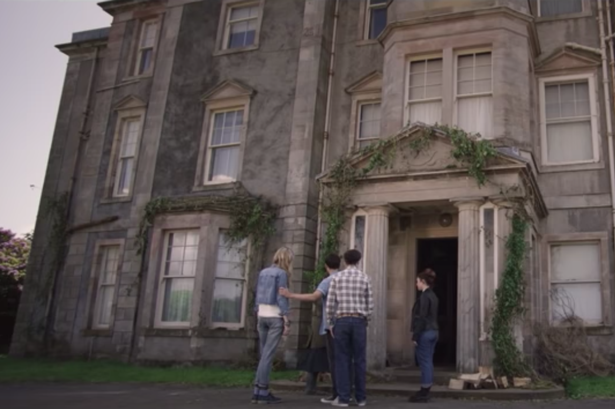 The premise is familiar, acting okay, and twists are perfectly timed to stave off boredom. Nothing about it is particularly amazing, but nothing is outright terrible, either. The film attempts to hinge on its relationships, telling a story about a brother and sister who only have each other (even though they do actually have a grandpa who just isn’t all that involved since he drowns all his sorrows in good, old-fashioned denial). But by the end those relationships aren’t established enough to lend the finale the emotional heft it so clearly goes for. Similar Netflix horror offerings like The Ritual and Veronica did it much better. In the plus column, points for the double twist on the premise and more blood than usual for a ghost movie. Also, creepy ghost kids! In the minus column, however, deducted points for a final act in which everyone just kind of stupidly wanders into danger even though by that point they should seriously know better. I know that’s a horror trope, but I’ve rarely seen it pop up like this in the final act, with the final girl literally just randomly bumping into the villain. Also, the camera shies away from depicting outright gore at the end, suggesting rather than showing. An admirable idea, sure, but it actually creates more confusion. You’ll swear one character has just had a machete dropped on his chest only to learn minutes later, no, he was just hit in the leg. Verdict: Admirable in some ways, flawed in others, Malevolent executes some clever twists but is probably best enjoyed by someone who hasn’t already seen this all done countless times before in other horror movies. I’d say skip it unless you just need a quick ghost story fix while waiting for The Haunting of Hill House to arrive later this week. What did you think of Malevolent? And what other Netflix & Chills offerings are you looking forward to? I can’t wait for The Apostle and The Haunting of Hill House. What about you? The word-of-mouth on Apostle is much stronger. I’m personally getting far more of a, I guess, “What if Jeremy Saulnier directed The Wicker Man?” vibe from it. Expecting more gruesome brutality than traditional scares.